In Rhode Island, suicide is the third-leading cause of death in youth ages 24 and younger. The Rhode Island Child Death Review Team, coordinated by JSI Research & Training Institute, Inc., conduct comprehensive reviews of deaths of children and youth age 0-to-17 in order to identify ways in which deaths from like causes might be prevented. 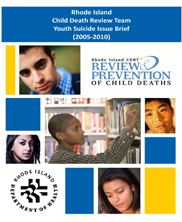 This Youth Suicide Issue Brief focuses on suicides of RI youth age 13-24 between 2005-2010, and aims to serve as a resource for better prevention efforts in the states. The report presents the results, makes suicide-prevention recommendations, and lists suicide-prevention resources. Jennifer Kawatu, JSI Research & Training Institute, Inc. November 2011.